← Dublin: Town of Saints and Sheep, and lots of drugs too! London continues to be awesome! This past week has seen some very hot and very rainy days. Although I am from the desert, the hot days here seem to be much warmer because, unlike Las Vegas, there are not many places in the UK that have air conditioning. This can be particularly uncomfortable if you use the underground to commute! The only breezes down there come from the zooming trains, and often you arrive at your destination and leave the station gasping for fresh air! On the flip side, I have found the wet weather here to actually be very like Puget Sound. It can be very quick to change, going from light drizzles, to pockets of sun, to downpours. But here umbrellas are used way more than on campus! So far my internship has been going very well. I enjoy everything, especially the people I have had the chance to meet, and the things I have been fortunate enough to see. If you are at the Foundling Museum for any length of time and you’ll notice that at the top of any hour there is a fabulous cacophonous din of clocks ringing in the new hour. There are quite a few historical clocks throughout the museum, and when I hear them I like to think about how long these clocks have been around. They have stoically sat, ticking away time, years beyond the lives of their makers. Normally once a week the clocks are wound so that they continue to keep good time. 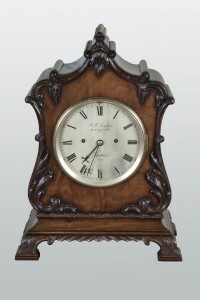 This week we had a very special clock preservation and restoration event. 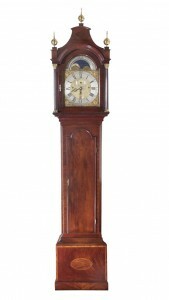 The clocks were taken apart and oiled and repaired and kept in good condition. It was really interesting to watch, and takes a lot of skills to do. I spoke with one of the men working on the clocks, and he said that historical clocks are especially difficult to work with because they often do not follow any established pattern. The earlier the clock, the more unique its inner workings. Now that I have seen how these clocks work on the inside, I will be even more aware of their pasts. 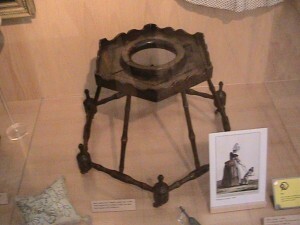 The childhood museum is very good. It is very much a kid friendly place, but it is also interesting for kid’s at heart. I found it also to be a slightly nostalgic place for me (in a good way though). There are toys and objects there that can make you remember atime when you were small. But the older stuff there also makes you realize that *everyone* was once small. Babies and children of the 18th century were not so different fro the way they are now. There was a very cute story about a donated teddy bear named Tommy. 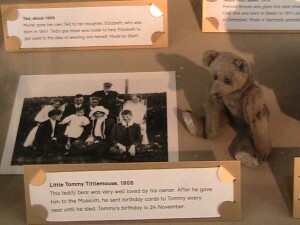 His owner received the bear in 1908, and kept him throughout his life. After donating the bear to the museum, he continued to visit the bear and sent his favorite toy a birthday card every year until the man passed away. Lastly this past weekend was the Trooping of the Colour! This is the official celebration of the Queen’s Birthday complete with the presentation of a regiments flag (colours). I was lucky enough to go and see the queen and other members of the royal family, along with the whole ceremony. See the Queen, Prince William, and some lovely marching French horns (I play so I couldn’t resist) here. This week should be very fun! I am going to the London Metropolitan Archives and Madame Tussau’s! Should be awesome! This entry was posted in Danielle Acheampong '11, London. Bookmark the permalink.